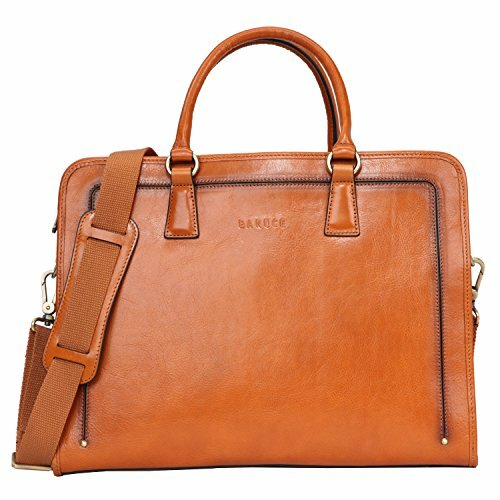 This briefcase made of Italian vegetable tanned leather. It is easy to get scratching and might get scar or fleck on surface, those are the natural witness of a created leathers exactly same in the world. Those imperfect real could not be cleaned. The longer you use the vegetable tanned leather products, the more gloss it will be. 3 compartment with zipper around closure; Interior with 3 x pen slots, 6 x slip pockets,1 x padded sleeve,1 x zippered pocket. Desgin as laptop briefcase, messenger bag, office satchel.